Passenger cars are developed to move on smooth paved pre-designed roads. To keep vehicles on road, we need a steering mechanism to provide steer angle as an input to the vehicle dynamic system. Ideally, all wheels of a vehicle should be able to steer independently such that the vehicle follows the desired path at the given speed. 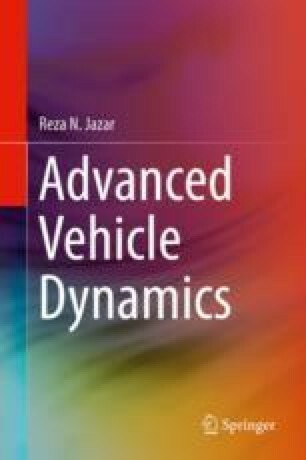 In this chapter we review steer and road dynamics. Roads are made by continuously connecting straight and circular paths by proper transition turning sections. Having a continuous and well-behaved curvature is a necessary criterion in road design. The clothoid spiral is the best smooth transition connecting curve in road design which is expressed by parametric equations called Fresnel Integrals. The curvature of the clothoid curve varies linearly with arc length and this linearity makes clothoid the smoothest driving transition curve. Having a road with linearly increasing curvature is equivalent to entering the path with a steering wheel at the neutral position and turning the steering wheel with a constant angular velocity. This is a desirable and natural driving action. Ideally, perpendicular lines to all wheels of a vehicle intersect at a single point called the kinematic center of rotation. When a vehicle is moving very slowly, we may assume the velocity vector of each wheel is in their tire plane. Therefore, the perpendicular lines to the tire planes intersect at the kinematic center of rotation of the vehicle, somewhere on the rear axis. However, when the vehicle moves faster, the actual center of rotation will move away from the kinematic center of rotation. Steering mechanism relates the last and right steerable wheels and provide a mathematical relationship to calculate all steer angles based on the angle of the steering wheel or the steer angle one of the wheels.